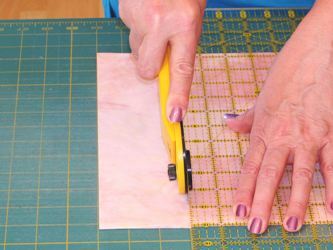 Proper rotary cutting is the key to starting off your quilting projects correctly. 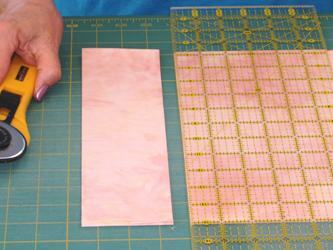 To start you need a good rotary cutter and a self healing cutting mat. 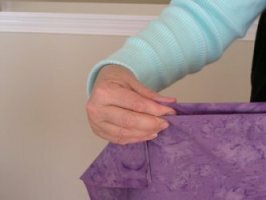 To start, straighten your fabric by holding it in the air (do not attempt to straighten on a table), and moving the closest side of the fabric to the right or left to make it hang straight and smooth. 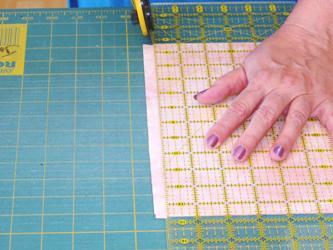 Holding on to the selvedges, lightly place the fabric on your cutting mat. 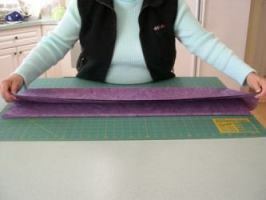 You can keep the fold away from your body, so that you can fold again, allowing the selvedges to meet the first fold. 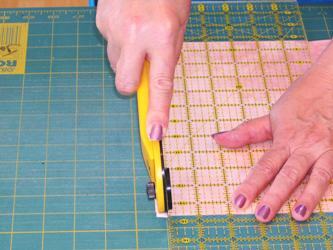 Place the fold closest to you, along one of the lines on your cutting mat. 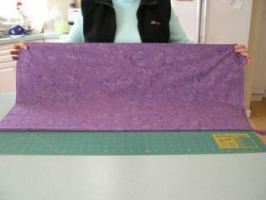 Place your ruler perpendicular to the fold line, lining up with a vertical mat line near the right edge of your fabric. Hold your ruler down with your left hand. Starting off of the fabric and cutting away from your body, press down and push away with your cutter, making a clean straight edge. Hold your cutter similar to shaking hands, with your index finger on the top to assist in keeping the downward pressure. It is also easier to press down while pushing away from yourself than it is to press down and pull toward yourself. 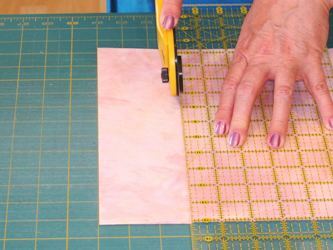 If your ruler is tending to slip, press down hard with your left hand and only cut up to where the ruler is being held, stop cutting, carefully move your holding hand up on the ruler and continue cutting. 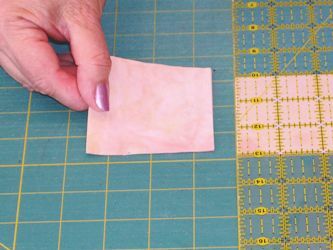 Move the strip to the right of the cut away from your fabric. 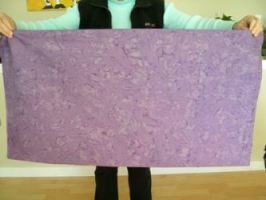 Try not to move the rest of the fabric. I would like to remind everyone that your rotary cutter is a very sharp instrument and can do serious damage if it is not closed after EVERY use. 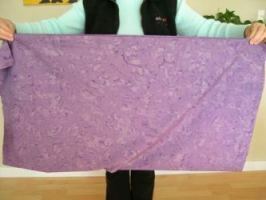 This quilter sent in this picture of the inconvenience she has gone through due to an accident with a rotary cutter. 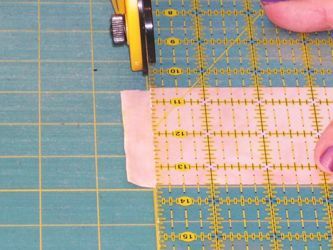 Carefully lift and move your ruler to the left until it is in place for your next cut, ie if you need a 3” strip, move the ruler to the left 3”. 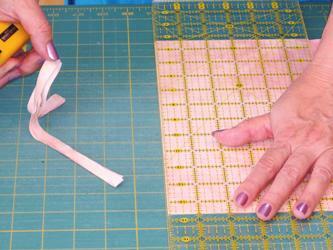 Line the ruler up with the lines on your mat, and again make your cut. Remember to close your cutter every time you set it down. 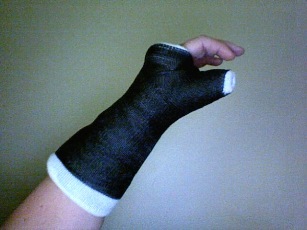 It is so sharp and cuts skin really easily. 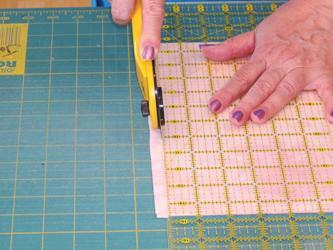 To cut 3” squares from a 3” strip, lay the strip horizontally along one of the lines on your mat. 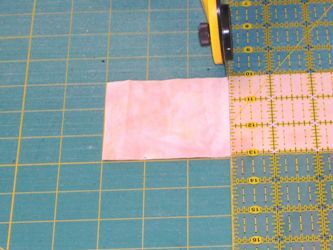 Starting at the far right, straighten the edge by cutting a bit off the end (lining the ruler up with the lines on your mat), then carefully move your ruler over 3 inches and cut as above. Continue moving the ruler over 3” and make another cut. Finished with "Rotary Cutting"? Return "Home"